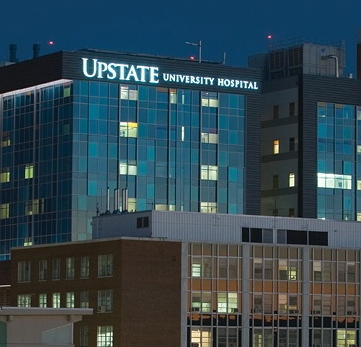 The Upstate University Health System is many things to many people. We are Syracuse’s only academic medical center, and we are the largest employer in Central New York with more than 9,000 employees. We take care of almost 20,000 inpatients and more than 400,000 outpatients each year. We feature the region’s only trauma center, and th e only emergency room devoted especially to children, and the Upstate Golisano Children’s Hospital rising like a tree house above Upstate University Hospital. Our doctors and health care providers practice what they teach, training the health care providers of tomorrow. About 1,500 students study with us each year, through one of our four colleges (nursing, medicine, health professions and graduate studies.) Our main campus occupies 25 buildings on about 50 acres, but we also have a clinical and educational presence in Binghamton, Ithaca, Watertown and throughout the Central and Upstate regions. In July, we acquired Community General Hospital, increasing our overall bed count to 715. The point is, many, many people are touched by Upstate. The institution that is so critical to this area is….rather large. Which is why we’ve created this blog. Think of it as a group of friendly museum docents, guiding you through Upstate, providing a reliable insider’s view of the campus, hospitals and research labs. Got a question? Ask. Need help? We will try to point you in the right direction. Just interested in staying informed? Check back often. This entry was posted in education, research and tagged academic medical center, Golisano hospital, health care blog, health care social media, hospital blog, hospital social media, medical blog, syracuse health care, syracuse hospital, university hospital, upstate medical, upstate university. Bookmark the permalink.